As the 19th century drew to a close, new-fangled machines that sputtered and coughed along country roads and city streets annoyed pedestrians and spooked carriage horses. The horseless carriage was considered a novelty, a toy for the wealthy, and a fad that would disappear when the novelty was gone. In the decade prior to 1900 there were only 300 motorcars in the entire country. But the automobile was a novelty that was not going away. Subordinate businesses boomed as part of the automobile-making process. Former dry goods manufacturers were now making canvas car tops, and upholstery and apparel makers turned out dusters and car blankets. Milliners busied themselves with designing hats for country jaunts that tied below a lady’s chin to prevent their blowing off. And there were rubber tires and inner tubes. Charles R. Flint, an original partner in the W. R. Grace Company, had been dealing in rubber since 1878. While the automobile business was in its infancy in 1892, he organized nine firms which made rubber footwear to consolidate, forming the United States Rubber Company. Before long the company was making 70 percent of the country’s rubber boots, galoshes and related footwear. The enterprising Flint recognized the potential of the growing auto industry and in 1898 founded the Rubber Goods Manufacturing Company to make, along with other industrial rubber products, tires. A year later the company was acquired by United States Rubber. The subsidiary was renamed The United States Tire Company. The burgeoning giant purchased its own rubber plantation covering over 90,000 acres in Sumatra in 1910, guaranteeing a constant source of raw materials. 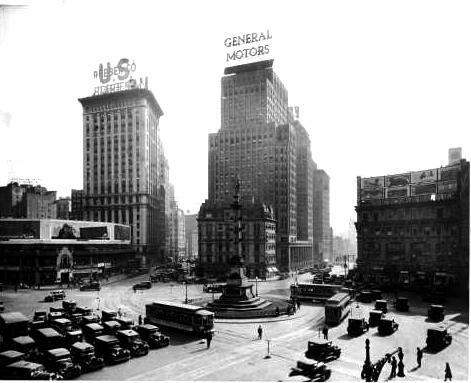 It was time for United States Rubber to make a presence along Automobile Row. The same year that the company purchased the plantation, C. B. Rice was operating his automobile showrooms at 1790 Broadway at 58th Street, just south of Columbus Circle. Here he sold Baker Electric Vehicles. But he wouldn’t be there for much longer. The “rather free Renaissance treatment” was designed by Carrere & Hastings whose masterful New York Public Library had just been completed that year. The white marble tour de force firmly established Thomas Hastings and John Merven Carrere as among the foremost architects of the day. In actuality, the style was Beaux Arts and, like the Library, was clad in gleaming Vermont marble. Long piers between the windows stressed the verticality of the skyscraper. The architects rounded the corner giving the structure a nearly bow-like appearance. The building was crowned by a deep copper cornice. Thoroughly modern, the building offered tenants the latest in office technology. “The mechanical equipment of the building includes complete independent heating plants, with vacuum circulation, standpipe equipment for fire protection, vacuum cleaner plant for the entire building and electrically operated elevators of the gearless traction type,” reported the Tribune. Also in the building were the offices of the Metropolitan Dealers’ Motor Truck Exchange, Inc. All the while U.S. Rubber marketed its other products—like the enormously popular KEDS rubber-soled shoes with canvas tops—from No. 1790. By the 1930s more diverse tenants were leasing space, like the National Air Rifle League that promoted annual marksman tournaments to teenaged sharpshooters. In 1940 United States Rubber sold the building to a holding company, keeping only a select few offices here while the bulk of the firm moved to No. 1230 6th Avenue. Shortly afterward, on October 13, The New York Times reported that The National Council, Inc. “and its various affiliated organizations” had leased the 8th to 14th floors; about 45,000 square feet of space. After significant interior alterations, the Council’s medical-related organizations moved in. 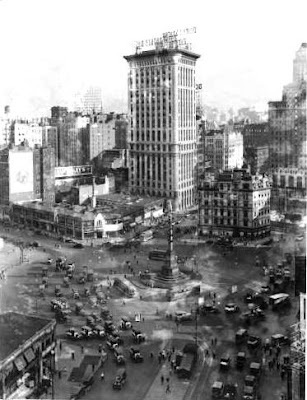 Among the new tenants were the National Tuberculosis Association, the National Health Library, the American Nurses’ Association, the National Committee for Mental hygiene and the National Heart Association. At a time when racial equality was still beyond the horizon, The National Association of Colored Graduate Nurses, Inc. promoted the welfare of Black nurses and worked to fight racial discrimination in nursing. The tenant list was not composed only of medical-related organizations. Through the 1940s the Paper Cup and Container Institute was headquartered here and the Department of State leased three full floors. In 1951 United States Rubber closed its last offices in the building--at the same time that the property was sold to the West Side Federal Savings Bank. That year the Department of State took its fourth floor. The upper floors became home to the NCAAP in 1967. After having its national offices at No. 20 West 40th Street since 1945, the organization took the 11th and 12th floors “to provide for an enlarged professional and clerical staff.” From here the NCAAP also published Crisis Magazine, a periodical aimed at exposing and fighting racial inequality and discrimination. At the same time the Hearst Corporation was here publishing magazines like Esquire, Marie Claire and the popular Avon Books; as was Mills Music, Inc., later Columbia Artists Management, Inc. In 1985 the bank sold the building to 1790 Broadway Associates. The new owners restored the lobby which had been mostly obliterated by the bank and cleaned the façade. Preservationists were excited when plans were announced to reproduce the Carrere & Hastings ground floor arcade, using original plans and consulting with Herbert Tannenbaum. many thanks to reader Marlon Buenck for requesting this post.